Tatiana Vassilievna Youssoupoff (1769-1841) was the youngest of the five daughters of Basil Andreivitch Engelhardt and Helena Alexandrovna Potemkine. Unlike her sisters Varvara Galitzin and Catherine Skavronsky (see cat. nos. 30 and 48), she was never the mistress of her uncle, Prince Potemkin. In 1785 she was wed to Lieutenant General Mikhail Sergueivitch Potemkin, by whom she had two children. She was widowed in 1791 and two years later married Prince Nicholas Borisovitch Youssoupoff (1751-1831), one of Russia's great landholders and the former ambassador to Turin. This second marriage was an unhappy one, and following the birth of a male heir in 1794 , the couple separated. Sensitive to the arts, Princess Youssoupoff maintained for many years a literary salon which attracted the poets Derjavine and Pushkin. Vigee Le Brun received other commissions from the sitter and her family. It was for Prince Nicholas Borisovitch that she executed in Turin in 1792 a portrait of Julie Le Brun as a bather (present location unknown). In Russia the artist also painted portraits of the Princess's son Boris Nicholaevitch as Cupid (former Youssoupoff collection) and of her daughter by her first husband, Catherine Mikhailovna Potemkin (present location unknown). In the present portrait, the intertwined initials carved into the bark of the tree - CS - are purportedly those of Princess Youssoupoff's sister, Catherine Skavronsky. The same monogram decorates the miniature held by the Countess in her portrait painted at Naples in 1790 (cat. no. 30). This painting could well illustrate what was meant in eighteenth-century France by the term aimable antiquite, and it has more in common with works by Joseph Vien, for example, than with the austere female portraits of Jacques Louis David. Vigee Le Brun never fully assimilated the lessons of the Graeco - Roman revival. Her portraiture displays neither the frigid detachment nor the Geometric stylization of David's Mme de Verninac (1799) and Mme Recamier (1800). 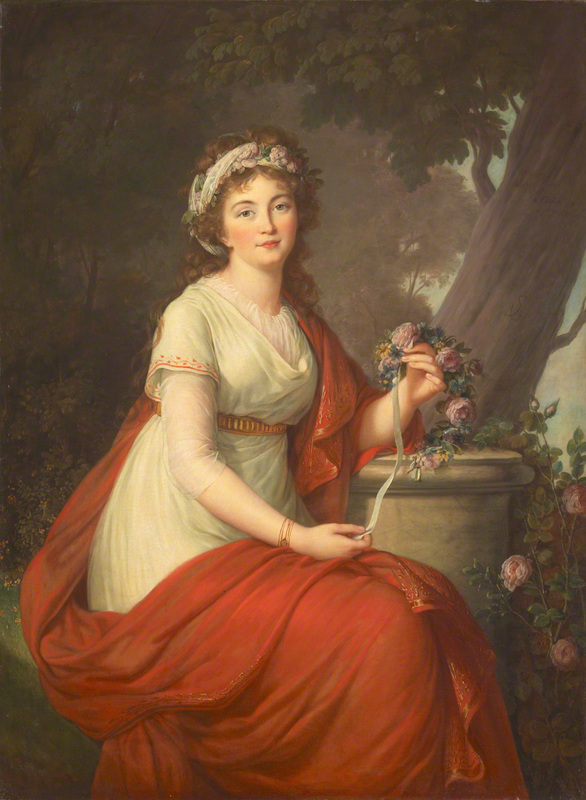 Here, the lovely Russian noblewoman, seated in a rose garden, leans on a marble pedestal as she tresses a crown of flower with a fillet of ribbon. A transparent kerchief into which are bound a number of pink roses is woven through her blond curls. Over a gauzy undergarment, she wears a simple short-sleeved sheath with a low decolletage and a high waist. The warm red cloak bordered with classical designs contrasts with the white of the dress; the verticality of the pose is relieved by the tree growing diagonally at the right. The softness of the contours, the painterly effects, and vibrant palette, as well as the idylic setting, impart to this exqusitely sensitive portrait a rococo rather than an "antique" flavor. An anonymous copy of the portrait is in the museum of Archangelskoye, the former Youssoupoff palace located near Moscow. PROVENANCE: Princess Tatiana Youssoupoff; by inheritance to her son, Prince Boris Nicholaevitch Youssoupoff (1794-1849); by inheritance to Princess Z. N. Youssoupoff, Prince Felix Felixovitch Youssoupoff, Saint Petersburg; confiscated during the Russian Revolution and deposited at the Museum of Fine Arts, Moscow; later deaccessioned and acquired by the present owner. MAJOR EXHIBITIONS: Saint Petersburg, Blue Cross Exhibition of Russian Portraits During 150 Years (1700-1850), 1902, no. 113; Saint Petersburg, Taurida Palace, Artistic and Historical Exhibition of Russian Portraits, 1905, no. 257; New, York, Wildenstein, French Painting of the Eighteenth Century, January 21-February 21, 1948, no. 42. SELECTED REFERENCES: Souvenirs, 111, 346; Grand Duke Nicholas Mikhailovitch, 1905, 1, no. 10, illus ; A. Prakhoff, "On the Collection of Pri'nce Youssoupoff, French School," Khudozliestvennyia sokrovischa rosii (Art Treasures in Russia), 1906, pp. 205-206, no. 114 (text in Russian), illus. ; Nolhac, 1908, pp. 112, 162, illus. facing p. 160; Hautecoeur, [19171, p. 107; Helm, [19151, pp. 32-33, 225; Blum, 1919, pp. 71, 102; S. Ernst, La Calerie Youssolipoff, ecole francais, Leningrad, 1924, p. 176, illus. ; L. R6au, "Catalogue de I'art franqais dans les Musees russes," Bulletin de la Societe de I'Histoire de I'Art Franqais, 1928, p. 244; Nikolenko, 1967, pp. 93, 105, no. 17, illus. p. 105.